Home » Tips » What is that weird smell in my car? Have you noticed some odd, sometimes putrid smells coming from somewhere in your car? If you’re positive that you have cleaned out all of your trash and you still smell something funky, there could be a problem with your car. 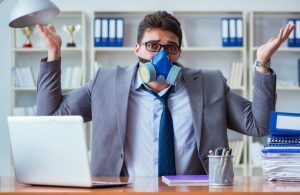 Continue reading to get a few possible explanations for that bizarre odor. Burning oil is very recognizable and can be a disgusting smell. Leaking oil is a common problem and it doesn’t usually mean anything too bad. However, it can sometimes hit your exhaust system which causes it to burn and produces a terrible odor. Other than the smell, a sign of burning oil is a blue, smoky cloud coming from under the hood. A quick service appointment to get the leak patched up will solve the problem. Your car’s catalytic converter is meant to control emissions and when it’s not working right, it can cause a sulfur-like smell. This would generally happen when you turn your engine on. It isn’t a sign of a serious problem, it just causes an unpleasant odor. Nonetheless, we recommend that you get your catalytic converter fixed so your emissions are in order. If you notice a sweet, syrupy smell when you turn your heat on, it’s probably because your heater core is leaking. This smell is a result of antifreeze fluid and it may also cause a filmy fog on your windshield. Burnt brakes or a burnt clutch can be smelled when you apply the brakes. If you ride your brakes too much or leave the parking brake on, you will eventually burn your brakes out. This can be solved with a brake replacement service. This entry was posted on Tuesday, February 12th, 2019 at 3:54 pm	and is filed under Tips, Vehicle Service. You can follow any responses to this entry through the RSS 2.0 feed. Both comments and pings are currently closed.